Our French guided walking holiday in the Jura as well as our self-guided Jura Wine Trail walking holiday explore the Jura region by foot, first discovering the region of gorges, vines and historic villages in the north west, before travelling south east to visit the High Jura. This page provides some more information on one of the Jura's interesting villages and its remarkable surroundings. Nestled in an area where three valleys meet and boasting an exceptional view, Baume les Messieurs has clustered its houses around a Benedictine abbey, which is a magnificent example of Romanesque art of the Jura and houses one of the greatest polychrome altarpieces in Europe. 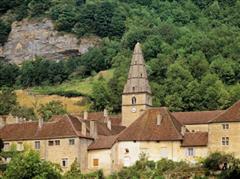 The village lies within the most extensive of the steephead valleys of the Jura escarpment, the Reculée de Baume. It is therefore almost surrounded by limestone cliffs about 200m high. The River Seille has its source within the Reculée and flows through the village. A short tributary of the Seille, the River Dard, merges with the Seille at Baume; at the source of the Dard, also within the Reculée, there is a notable series of caves. The village is dominated by the former Baume Abbey. 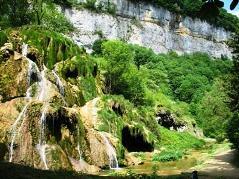 The Grottes de Baume les Messieurs is a river cave, which is very active. The spring flows during snow melt, when an enormous beam of water comes virtually out of the steep cliff. The path into the cave crosses the spring twice on two bridges at different heights. The waterfall from the cave entrance is below the upper bridge, but above the lower bridge. The cave is the underground gorge of the river Dard. The path is built like bridges, above the water. After the entrance gallery, visitors are taken through tall, narrow passages and chambers. The Salle des Chauves-Souris (Chamber of Bats), located 70m behind the entrance, is little more than a widening of the main passage. The Salle du Lac (Chamber of the Lake) is located 200m from the entrance, and has superb acoustics. From the Salle Renaud the path leads up to a dry passage of a higher level, and returns to the river cave at 400m from the entrance. This part of the cave is called Catafalque and ends at its most northern point 450m from the entrance. The caves are home to shrimps as well as bats.